An e-business new product development (NPD) knowledge articulation model is built from the interdisciplinary empirical and theoretical literature. The model is intended to facilitate a case study of a large multinational mobile communications services/products company (with team members in Europe, Asia and Australia). The NPD teams include subject matter experts that function as a community of practice, electronically collaborating in a virtual context. The knowledge created and shared in the NPD teams involve various unknown levels of tacit and explicit ideas, which are difficult to understand or assess. The goal of the research is to build a tacit knowledge articulation framework and measurement construct that can be used to understand how a successful (or unsuccessful) NPD team operates, in terms of knowledge innovation and productivity. Complex issues and controversies in knowledge management are examined to clarify terminology for future research. In new product development (NPD) for business, individual tacit knowledge must be articulated to be shared with other specialists so as to augment ideas and design new products/services (Chang & Cho, 2008; Kyriakopoulos & deRuyter, 2004; Sherman, Berkowitz, & Sounder, 2005). In the management science literature, the leading innovation-focused researchers argue that the ability to capture and leverage tacit knowledge is itself a competitive business advantage and it ensures organizational sustainability (Edvinsson, 1997; Hamel & Prahalad, 1994; Handy, 2001; Nonaka & Teece, 2001; Sveiby, 1997b; Teece, 2001; von Krough, Ichijo, & Takeuchi, 2000; Wiig, 2002). It takes knowledgeable subject matter expects to articulate, collaborate and transform individual tacit innovations into workable products and services that will match consumer needs in the market (Leonard & Sensiper, 1998). In e-business, technology can be leveraged to facilitate tacit knowledge articulation and sharing for NPD, allowing insightful people to electronically collaborate (e-collaborate) across geographic boundaries and over different time zones (Backman, Borjesson, & Setterberg, 2007; Ettlie & Elsenbach, 2007; Gordon, Tarafdar, Cook, Maksimoski, & Rogowitz, 2008; Reid & Brentani, 2004; Sawhney, Verona, & Prandelli, 2005). There are many examples of this (yet there is no attempt here to single out any particular one as being better than others). Multinational companies such as Nokia, Xerox, SAP, Apple, Microsoft and IBM are representative e-business case studies (cited in the literature and stock markets) demonstrating the capability to harness tacit knowledge in NPD across geographic and time boundaries to achieve competitive advantage and long-term sustainability (Chang & Cho, 2008; Handy, 2001; von Krough, et al., 2000). There are two interesting trends associated with tacit knowledge sharing in the e-business economy that reveals its strategic benefit for NPD. 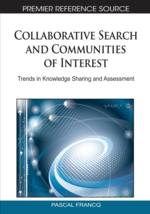 The first is the e-collaboration of multiple stakeholders in the supply/value chain (Strang, 2008a), such as suppliers and customers interacting, providing social capital to influence NPD (Gronröos, 1994; Kavali, Tzokas, & Saren, 1999; Nonaka & Teece, 2001; von Krough, et al., 2000). The second is the concept of tacit meta-knowledge being intellectual capital, meaning that knowledge about knowledge (meta-knowledge) can be considered more valuable than the underlying information or product (Boudreau & Ramstad, 1997; Kim & Mauborgne, 1999; Stewart, 2000). For example, in the financial market, tacit knowledge shared within and between investment analysts, can generate more profit than the explicit value increase from the knowledge about the underlying stocks. We know the exponential power of leveraging tacit knowledge from the global economic crises of 2008 because those that could leverage the tacit meta-knowledge restructured their investments beforehand (or converted currencies for quick money market gains). In the vacation industry, the tacit knowledge for designing consumer solutions using multifaceted tours and multiple travel routes can be worth more than the combined margins on the separate package components. “The air travel industry has become two different industries: the flying industry, which is marginally profitable at best, and the information-about-flying industry, which makes money hand over fist.” (Stewart, 2000, p. 15).